WASHINGTON – Homeland Security officials said Tuesday that they have cut the time it takes to deport Central American adults and seen a sharp drop in the number of kids trying to cross the border. 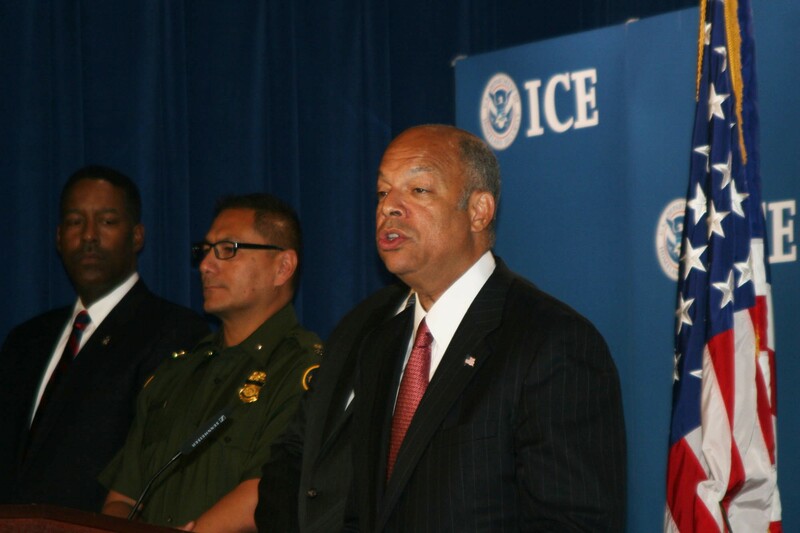 Secretary Jeh Johnson also said the department’s Operation Coyote is making a dent in the human smuggling trade, arresting 192 smugglers in the last month and seizing more that $625,000 from almost 300 bank accounts of suspected traffickers. But as he claimed successes, Johnson said much more needs to be done. He repeated calls for Congress to act on a White House request for $3.7 billion in emergency funds to handle the surge of Central Americans – many of them children – crossing the Southwest border. About $1.1 billion of that amount would go to Immigration and Customs Enforcement, with $879 million to increase detention capacity and $100 million to support law enforcement efforts in Central America. “The funding we’ve requested is very targeted at detention, deterrence and removal,” Johnson said at an afternoon news conference, backed by officials from ICE, Customs and Border Protection, the Justice Department and other agencies. It comes one day after the White House said that the number of unaccompanied immigrant children caught in the Rio Grande Valley dropped from an average of 355 per day last month to just 150 per day after the first two weeks of July. Johnson said the government had reduced the amount of time it takes to repatriate adults to Central America, from about 33 days to about four days now. “We are sending between six and 10 flights a week into each of these Central American countries to send these adults back,” he said. While children from neighboring countries who are found here illegally can just be turned around and sent home, those from farther away – like Central America – have to be turned over to the Department of Health and Human Services. It is charged with caring for those children until they can be placed with relative. A recent flood of Central American immigrants has overwhelmed border facilities in Texas, forcing them to be shipped to holding facilities in other states, including Arizona. A statement this week from Arizona Sens. John McCain and Jeff Flake said a reduction in the backlog of backlog of unaccompanied immigrant children could mean those children will no longer be transferred from Texas to a detention center in Nogales for processing. 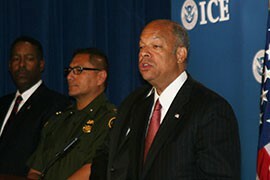 Johnson stressed the importance of the administration’s funding request, saying that at current rates, ICE will run out of money in mid-August and Customs and Border Protection will run out of money in mid-September. “Doing nothing in Congress is not an option,” he said. Homeland Security Secretary Jeh Johnson touted progress in the fight against a tide of Central American immigrants, many of them children. Numbers of kids caught are falling and the time it takes to deport an adult is also dropping, he said.